This is a stunning book and it has been very well received and praised since it was published in 2004. 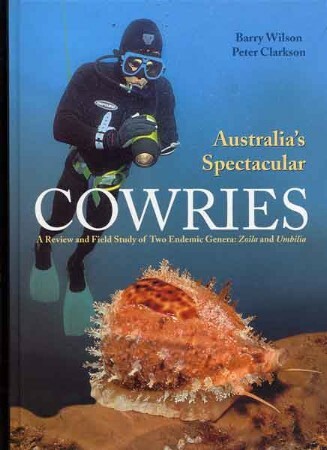 The book is a very thorough discussion and description of the Zoila and the Umbila.Two of the endemic genera of the Cypraea that inhabit Australian waters.. 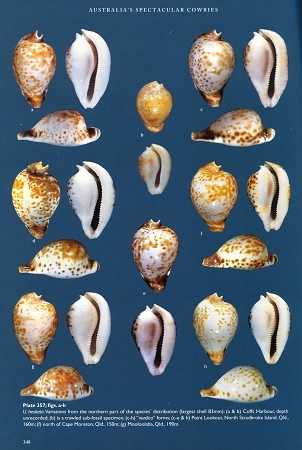 Since the shells in these genera tend to be very variable, usually quite valuable, and most often very beautiful they are extremely popular with collectors around the world. But the variations found among these shells have caused them to become a taxonomic nightmare for experts and collectors alike. 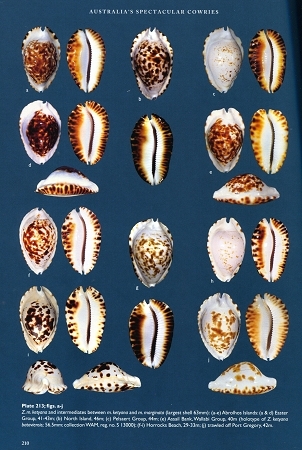 As is often the case with shells you wind up with a multitude of shells that appear to be very similar to each other but that have been given a whole host of sub specific and form names based often on very slightest differences between them. 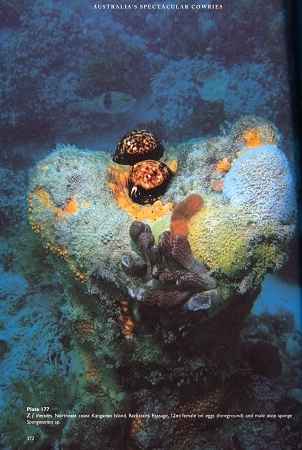 This book offers a sensible and no nonsense approach to their classification based both on scientific evidence and on the carefully examined characteristics of the shells.I think that everyone interested in these shells and all Cypraea collectors in general should own a copy of this book.The text is clear and thoughtfully written and it is easy to follow the authors to the conclusions that they draw about these shells. And as a bonus the photographs and the plates contained in this book are of outstanding quality. There are many close up shots of the shells in their natural surroundings and the numerous varieties of each species that are pictured are truly eye opening.